The North Dakota Department of Transportation (NDDOT) is currently implementing a Centerline and Edgeline Rumble Stripe Program across North Dakota. The stripes have been installed on many of our two lane highways as a safety measure to help prevent traffic fatalities and injuries from motor vehicle crashes. Rumble stripes are grooved patterns on the roadway that provide a rumbling sound and physical vibration, immediately alerting inattentive drivers they are leaving their driving lane. Rumble stripes are an effective countermeasure for preventing roadway departure crashes. In North Dakota, nearly 62% of all fatal crashes during the past three years involved lane departure. Nationwide, centerline rumble stripes are a proven countermeasure providing a 40% to 60% reduction in head on and sideswipe collisions. According to the National Highway Traffic Safety Administration (NHTSA) approximately 80% of all crashes and 65% of near-crashes involve some type of driver distraction. An average of one roadway departure injury crash occurs every 43 seconds nationwide. Shoulder rumble stripes are now used in 46 of 50 states. How do rumble stripes help reduce crashes? The use of Centerline and Edgeline Rumble Stripes are documented as being a cost effective improvement in reducing head-on crashes, opposite direction sideswipe crashes and Run-off-the-Road (ROR) crashes. What is the difference between rumble stripes and rumble strips? 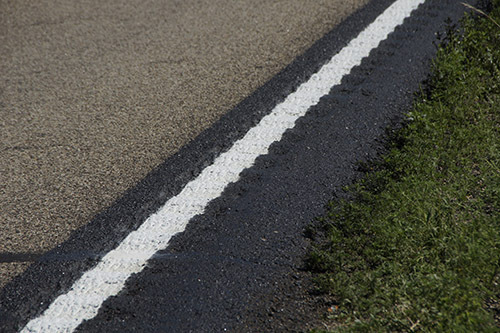 The difference between a Rumble Strip and Rumble Stripe is when a Rumble Strip is painted with highly reflective pavement markings, it becomes a Rumble Stripe. What are the different types of rumble stripes used across the United States? Centerline Rumble Stripes are placed on the center of undivided roadways to warn drivers they are leaving their intended lane of traffic and are an effective countermeasure in preventing head-on crashes and crossover crashes. Edgeline/Shoulder Rumble Stripes are installed on highway shoulders outside the travel lane and are primarily used to alert drivers who are leaving their intended lane. Saw Slotted Rumble Stripes at T-Intersection are installed on the full driving lane width to alert motorists of stop conditions. Transverse rumble Stripes are placed in the driving lane extending across the full lane width, to warn drivers of something unexpected such as unexpected curves in the roadway and work zones. 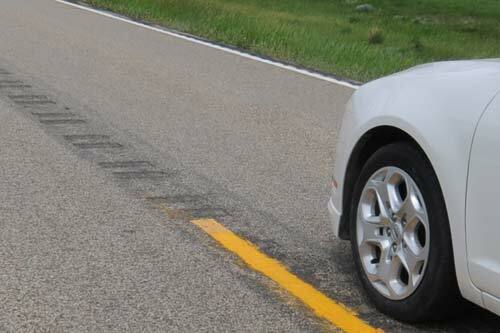 What types of rumble stripes are used on North Dakota’s roadways? Saw Slotted Rumble Strips at a T-Intersection these are installed on the full driving lane width to alert motorists of stop conditions. What are some of the other benefits of using rumble stripes. Rumble stripes can provide added visibility to the roadway during evening hours along with alerting drivers to the lane limits where conditions such as rain, fog, snow or dust reduce driver visibility.